About solar power with UK Solar Provider – your care free partner for Solar Power. With Years of experience in the Solar Industry, we have build several Mega Watts of Photovoltaic Powerplants – from small roofs of family homes over big farming sheds to ground mounted powerplants. Why is UK Solar Provider the best Partner for you? First of all, we know what it’s like to be a property owner! The People of UK Solar Provider built, own and run over 500 Kilo Watts only in the last year. We strongly believe in our own products, experience and quality and would never build a plant for you that we wouldn’t build for ourselves. we have all the knowledge needed for you not to worry about anything. Whatever the problem, we will take care about it! But we also have partnerships with local experts, therefore can achieve a smooth workflow with no unforeseen problems. We have direct partnerships and get the Solar Panels, the Inverters and the Mounting Systems, and when necessary also the materials for refurbishing the Roof DIRECTLY from the producers, cutting out the middle man and providing you with a Solarpower Plant with top noch quality for an unbeatable price. Therefore YOU can lay back, let us do the work, and enjoy the benefits of a low risk investment with high returns. All the products we use have outstanding quality, certifications and warranty. 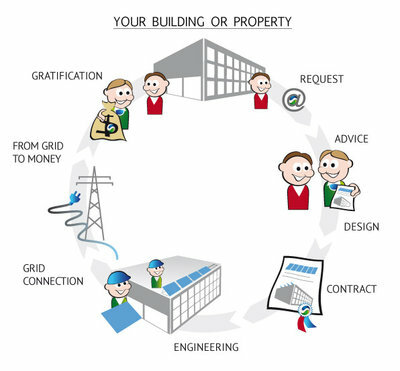 With UK Solar Provider you choose a partner with experience and the capability of precise planning, development, installation and maintenance. We use best practices acquired through our operations in Germany, the world’s leading solar market, to build safe, high-quality and cost-efficient power plants, with substructures customized for your roof. We get things right the first time! The revenues of a Photovoltaic Powerplant can be precisely calculated and therefore give you the opportunity to know what will you earn over the next 25 years, which is guaranteed no to change through the FIT-program, making it a low risk investment. There are no moving parts so maintenance is minimal and panels can be monitored remotely via the internet, email or text message. And all our products come with warranties. Through our precise planning you know what you will get before singing any contract. You will know exactly how much your Solar Powerplant will cost you, how much energy it will generate, how much income that will generate, how much you will earn for the next 25 years, every year.